Use the promo code ASTA2019 until March 31. 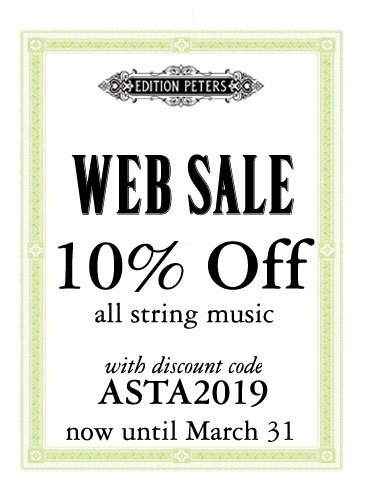 To celebrate our upcoming visit to the American String Teachers Association's national conference with legendary cellist and author Fred Sherry, we're bringing back our January web sale for a very special encore appearance: this month, only in our online shop, you can use the coupon code ASTA2019 to get all of our music for strings on sale for 10% off. In addition to Fred Sherry's Grand Tour of Cello Technique, a definitive new guide for the modern player, we're also excited to show off some of the other spectacular new additions to our string catalogue, including a viola transcription of Simon Fischer's essential Scales manual, and--from Simon Rowland-Jones--Bach's Sonatas and Partitas, in a definitive new edition. There are also some terrifi new dditions to our distribution catalogue, such as the publications of violist and teacher André J. Roy. Head of the McGill International String Quartet Academy and an expert on chamber and orchestral performance, Roy has created the one-of-a-kind String Quartet Technique, a set of etudes for all four members of the quartet. Distilled from his own years of coaching experience, Roy's method is designed to help any string quartet play with improved blend, intonation, and ensemble. Available now as a limited-edition score and parts, collected in a beautiful slipcover complete with magnetic clasp(! ), this is a must for the library of any string player or chamber music coach. We're also excited to offer Roy's viola transcriptions of two pieces originally composed for violin and piano: Brahms's Sonata No. 3, Op. 108, and Beethoven's Spring Sonata, Op. 24. Rather than simply transpose these sonatas down a fifth, Roy has retained the key of the original piano accompaniment, using discreet and idiomatic octave transpositions to exploit the lower range of the viola. The result is viola repertoire that is appealingly edited in every respect: cunningly transcribed, deftly fingered, and handsomely designed and engraved. Any of these titles can be yours at a 10% discount, along with every other piece of string music in our catalogue. Just surf to our website and use the promotional code ASTA2019 before March 31. And thanks to our friends at the Danish publisher Edition·S, we have another string bargain for you: order any movements from Wood Works, their new collection of folk music arranged by the Danish String Quartet, and you'll get a link for a free MP3 download of the corresponding tracks from the acclaimed record! Wood Works: The Complete Collection would be a worthwile addition to any chamber music library, whereas fiddlers curious to dip a toe into this gorgeous cycle can find a worthwhile introduction in The Sønderho Bridal Trilogy, a suite of three especially lovely movements from the album. Or pick and choose whichever movements you like, and download the corresponding MP3 for free! (Please note that there's no MP3 of Bosse Nordin’s Schottis, as it doesn't appear on the album.) They're all available from Peters in the US. Finally, the very independent English publisher SJ Music offers a fine catalogue focusing almost exclusively on solo and chamber music for strings, including brand new two-cello arrangements of beloved arias by Bizet, Mozart and Puccini--and we can offer 10% off their entire catalogue of string music with the coupon code ASTA2019.